Vesharr is a Grand Master Pet Tamer and offers a daily quest. Players must first defeat him in a Pet Battle and turn in his quest before gaining access to the pets he has for sale. Pokes at the enemy with a sharp beak, dealing 394 Flying damage. Flings 1-2 Quills at the enemy, dealing 197 Flying damage per hit. A sharp wind gust deals 354 Flying damage instantly and 78 Flying damage every round for 2 rounds. Persists through pet swaps. Flocks the target, causing 177 Flying damage every round. Lasts 3 rounds. Always hits if the target is Blinded . 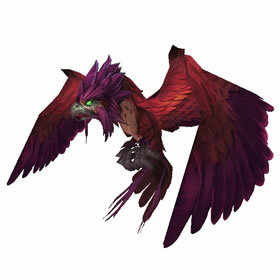 As was mentioned before, reputation with Arakkoa Outcasts influences the cost of this and the Kaliri Hatchling. At exalted you only have to fork over 800 gold for this one. Veilwatcher Hatchling is worth 950G when you get to Friendly with Arakkoa Outcasts :) Didn't buy this beautiful guy yet, still wandering if the price goes lower as you get more reputation with the faction! After you beat this tamer he gives you the option to purchase this pet for 1,000 gold and it is a Uncommon and the Kaliri Hatchling Pet for 10 gold also a uncommon pet. To find this tamer he is in the next zone over from Shadowmoon Valley called Spires Of Arak at Location 46, 45 which is a little west of the center of the zone. This tamer has two flying pets and one Mechanical that you need to beat before you can purchase these two pets. Hunted to near extinction for its feathers, thie kaliri has developed keen senses.